It’s that most wonderful time of the year again, and it’s only made better by these tasty snowmen. 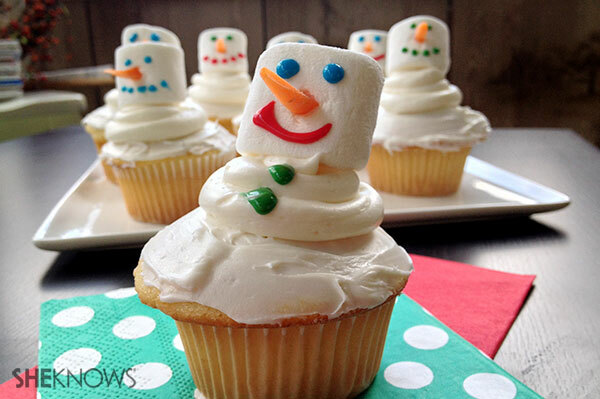 Sculpting an edible version of Frosty is super easy with this recipe. Bake the cupcakes, and allow them to cool completely. Cut the carrots into thin slabs; these will serve as the noses. Using a piping bag (or resealable bag), form concentric icing circles. Picture the base of a snowman, and create circles accordingly, with a larger circle at the bottom and smaller ones toward the top. Place a piece of carrot in the centres of the marshmallows, and use the scribblers to make the faces. Secure the marshmallow heads into the icing by pressing gently downward. Show you care by personalizing your gifts this Christmas with monograms, names and festive wishes on pretty purses. Great gifts can be made even more exciting with fun wrapping options.Plus, if the wrapping doubles as a gift too, what’s not to love? Begin by cutting two pieces of material into the same size. Sew the pieces together. If you have a sewing machine, this will be a breeze, but if not, sew them by hand. 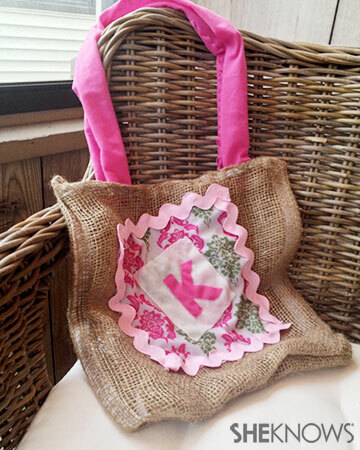 Add the embellishments of your choosing, and secure them onto the fabric with your trusty needle and thread. Fasten the handles, and you’re on your way. Thirty-one is a trusted source for your embroidery needs. 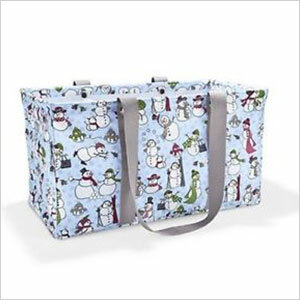 The company has a wonderful selection of fun and functional items — like this snowman utility tote (thirtyonegifts.com, $30) — just waiting for you to make your mark. Lands’ End has an incredible history steeped in stylish durability that goes hand in hand with excellent price points. 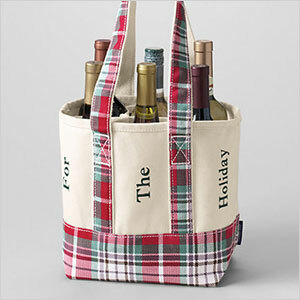 The bottle bag(landsend.com, $20) is a lovely selection for the wine connoisseur in your group. The Wedding Shop, brought to you by the good people at The Knot, carries a bevy of beautiful bags for you to choose from. You might be thinking, “The Knot? Isn’t that solely a bridal website?” Yes, but anyone can appreciate the variety and reasonable prices The Wedding Shop has to offer. 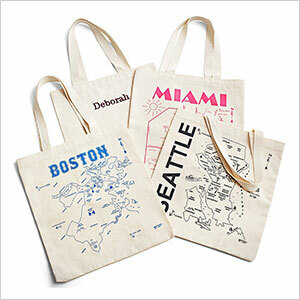 The map totes(weddingshop.theknot.com, $15) are a must-see! One should not forget the mecca of unique merchandise: Etsy. You might just stumble upon the holy grail of gifts when perusing the site’s many vendors. 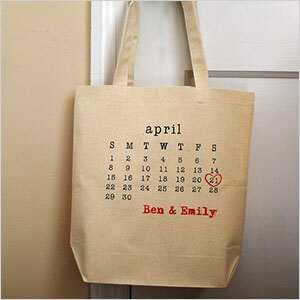 Aside from this adorable wedding date tote (etsy.com, $16) that would suit a blushing bride, Rachel Walter has a whole bunch of pretty bags — many with hilarious pop culture references — to choose from. 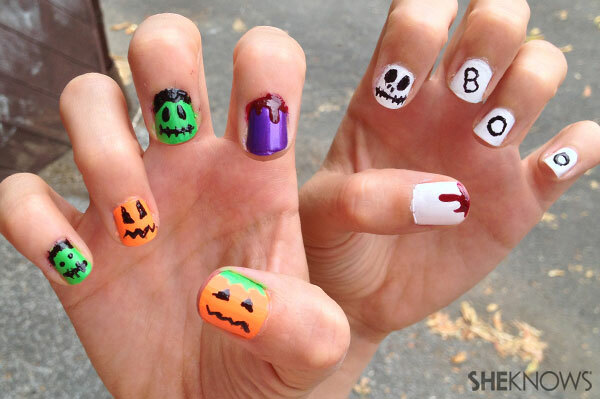 Whether your manicure is an extension of your disguise or nail art is your costume, get into the spooky spirit with Halloween nails. There are no set rules for these designs, so be creative with your colour palette. Begin with a base coat of your choosing. White really stands out and is perfect for making your skull pop. The figures are nothing more than primary shapes. Dip one end of a toothpick into a black polish, and make oval eye sockets. Dip your toothpick into the polish again, and scrape off any excess to ensure a large amount doesn’t drop onto the nail. Make slits for the nose. Finally, draw a line near the tip of your fingernail. Using the same short-stroke technique as before, incorporate lines to give the illusion of stitches. Painting the blood is really simple. Grab another toothpick, and splash red nail polish onto the fingernail. The drip effect is what you’re going for. Paint a nail or two in an orange hue, and then paint black triangles for the eyes. Throw in a mini-triangular nose if you can afford the real estate. The smile or lack thereof is at your discretion. A toothy grin or a zigzag — it’s your call. To make a Frankenstein face, paint the whole nail a shade of green. Add some hair by blotting the black polish brush along the cuticle. With a toothpick, dot a set of black eyes. 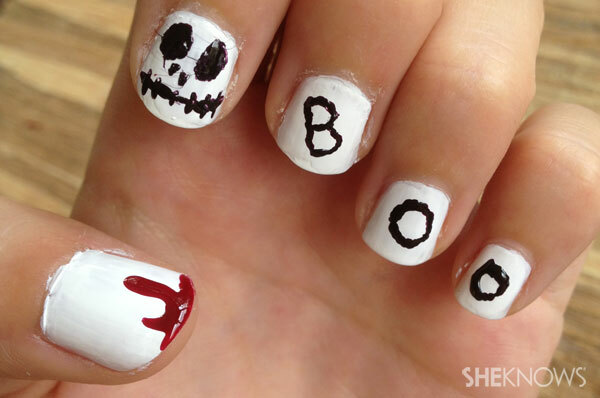 And as with the skull above, draw a line across your nail and create the stitches effect to make the mouth. 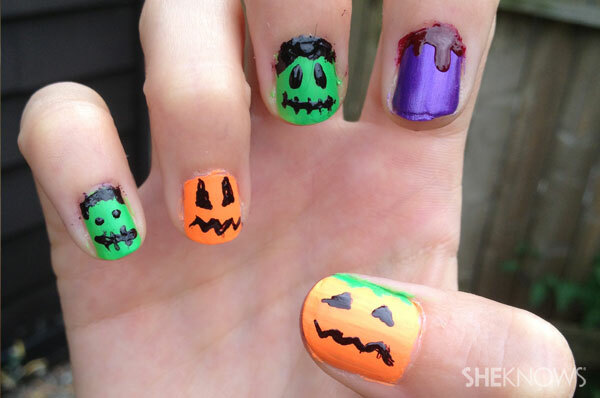 You can create a family of Frankensteins or an entire pumpkin patch per hand. Making a monster manicure can get messy, so have polish remover and Q-tips on hand to fine-tune your Halloween nail art. With the multitude of options out there, planning a party has never been easier. Whether you’re getting married, hosting a shower or celebrating a mitzvah, let the internet be your guide. First things first: You need to get the word out there. Invitations set the tone for your get-together, so choose wisely. Protect Mother Earth (and your pocketbook) by going paperless. 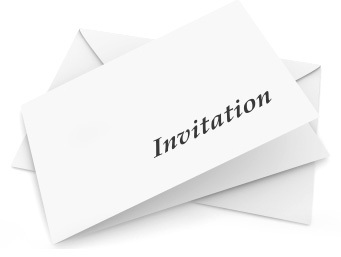 Websites like Evite provide a wide range of invitations. Paperless Post is another great option. Paperless Post prides itself on their unique invitations that reflect your personal style in an innovative way. To borrow their own words: “Beautiful design meets seamless technology”. Perhaps best of all, it’s free! Plus, think of all the money you’ll save on stamps. And, if you’re really feeling low-key about your impending fête, there’s always Facebook to connect your invitees to your event. A laptop can make a digital DJ come to life. Songzaand its extensive genres can satisfy even the biggest of music snobs at no cost. Grooveshark is great for artists or albums, but Songza casts a much wider net and supplies a variety of sounds all within one playlist. Connect to the venue’s sound system, and you’re in broadcasting business. Worried about your great aunt’s lack of wireless service? Then you might want to check out services like Vistaprint for your paper needs. Customize everything from itineraries to thank-you cards for your special day. Etsy is another easy alternative to personalizing your paper needs. Templates are available for purchase (reasonably priced at that), and then print your pretty little heart out. Bonus: the nice people atWedding Chicks have templates you can customize at no cost. Your crafty cousin will be clicking away with her Canon camera (as well as nearly every other attendee), so why pay for a professional photographer for your child’s birthday party? Create a personalized hashtag on Instagram so that guests can check out all the photos from the big event. If you’re not on Instagram, websites likePixlr allow you to edit pictures painlessly. Plus, once you’re done there’s a ton of online photobook options; Shutterfly anyone? Pinterest revolutionized the way we prepare for major life moments, from decorating a child’s room to unique ways to say “I do.” The collection of your design and decor inspiration all grouped together in one place facilitates event planning.